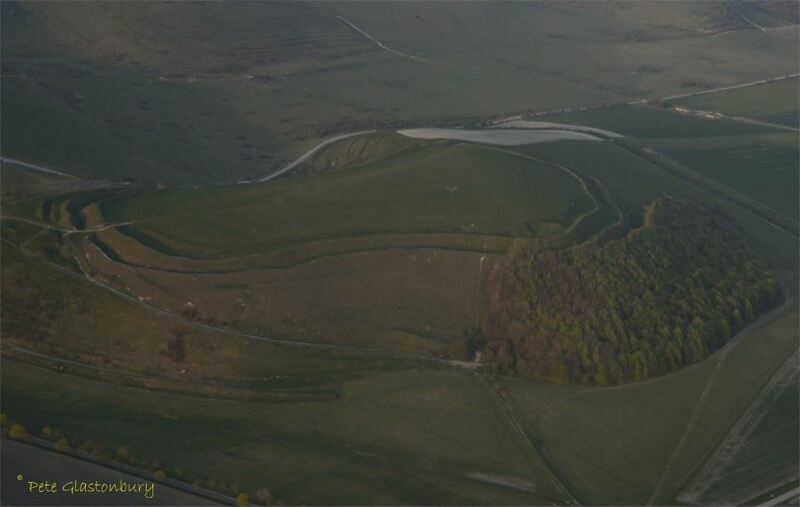 The above photograph, taken by Pete Glastonbury from a microlight aircraft, is of Yarnbury Castle, an Iron Age hillfort in Wiltshire, described by Historic England on Pastscape as ‘A multiphase, multivallate hillfort of 28.5 acres. The earthworks were surveyed by RCHME in 1991 and a full descriptive and analytical account can be found. Excavations have recovered Iron Age and Roman pottery, as well as inhumations, in both graves and pits, as well as other human remains. Iron Age and Roman coins were also found. 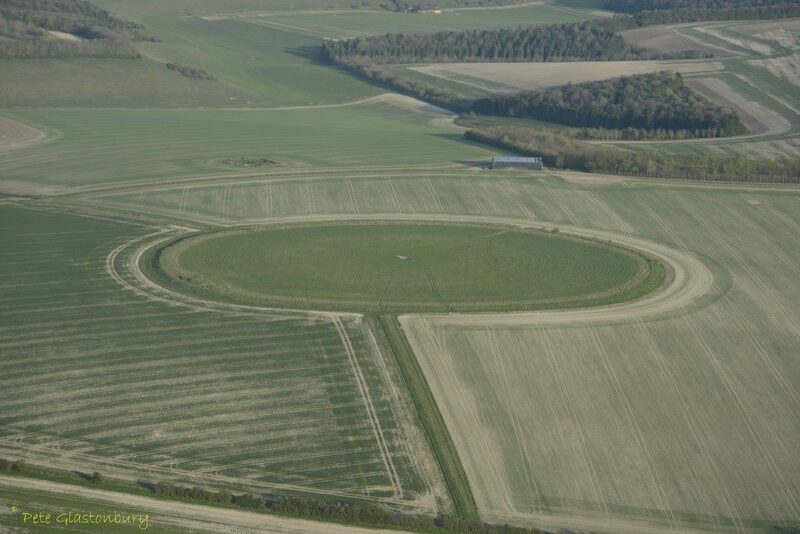 Within the main hillfort is an earlier enclosure 5.2 hectares in area. Intensity of occupation in the main hillfort is demonstrated by the recognition during the RCHME survey of over 130 probable structures, presumably representing the sites of round houses, as well as pits and other features. Between the earlier circuit and the inner rampart, a number of large compounds are visible, with possible stone footings discernible in many. In the southeast quadrant of the hillfort are the remains of the Winterbourne Stoke sheep fair, which was held biannually until 1916, when the surrounding area was commandeered by the army. The most prominent features are the sheep folds, a rectangular area 120 metres by 90 metres and consisting of 16 low mounds in two blocks of 8. The present sheep fold is probably of 19th century date, although the antiquity of the sheep fair itself is unknown. The discovery of Roman material, including pottery, tiles, coins and burials, during both excavation and on other occasions, has led to the site’s inclusion in Scott’s Gazetteer of Roman Villas. More on Yarnbury Castle and hillfort here, here and here. Archaeological finds from Yarnbury Castle and in Wiltshire Museum are listed here. 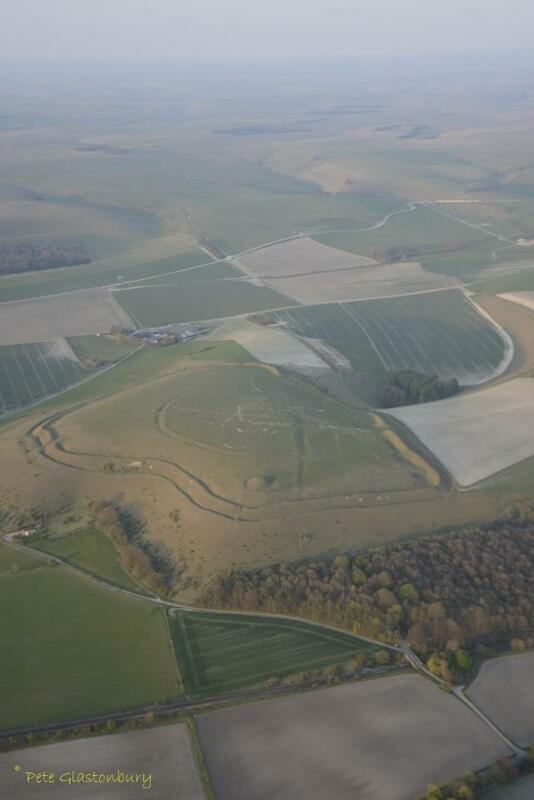 The Iron Age hillforts in Wiltshire are listed and mapped here. 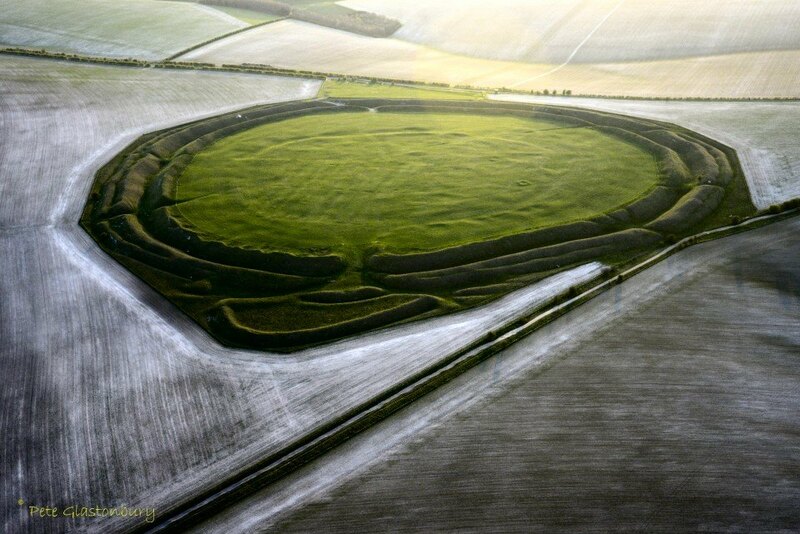 The above photograph is Scratchbury Camp, described by Historic England on Pastscape as ‘a univallate hillfort covering approximately 17ha. It is best preserved on its western side where the ditch is between 5 and 8 metres wide and up to 1 metre deep. The bank and ditch are both uneven in height and depth which is thought to be an original testament to the ‘group dug’ nature of the earthworks. There are three breaches in the bank which appear to be original. The north and west areas of the hillfort were densely populated with up to 100 structures present, visible as relatively shallow depressions. A D-shaped enclosure in the centre of the hillfort was previously interpreted as a Neolithic causewayed enclosure due to its interrupted nature and the discovery in the hill of jade and flint axes. Excavations by W.F. Grimes have since shown this to be an Iron Age enclosure, with Iron Age pottery in the primary fill, and the interruptions were probably been made by post-Medieval ploughing. All that really remains of this enclosure is one well-defined lynchet. The Iron Age hillfort dates to around 100 BC, but contains the remains of an earlier and smaller D-shaped enclosure or camp. The age of this earlier earthwork is subject to debate. More hill than history, ageless and oblivion-blurred. The Wikipedia entry for Scratchbury Camp is particularly informative here and further information is available here and here. More on Battlesbury Camp here, and here and on its archaeology here. More on Codford Circle here and its archaeology here. More on Liddington castle here and here. 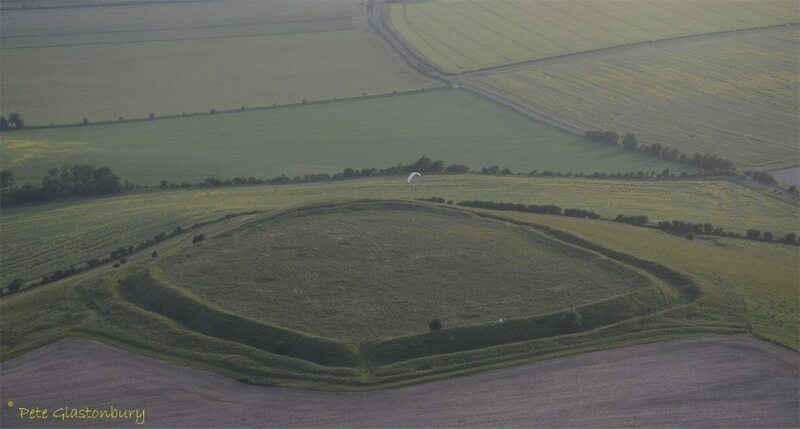 Just outside Wiltshire to its north east in Oxfordshire is Uffington Castle photographed above and described by Historic England on Pastscape as ‘An univallate Iron Age hillfort. It is D-shaped, enclosing 3 hectares, with a rampart and ditch, counterscarp bank, and a single western entrance. Limited excavation in 1853-8 and in 1922, indicated that the inner bank appeared to be sarsen faced, and two rows of postholes suggest either a timber palisade or posts were incorporated in the facing. Excavations in 1989-90 identified two phases of rampart construction, the earliest, early Iron Age in date, comprising box rampart with a backing ditch. A blocked entrance was identified in the eastern rampart, and dated to the 8th to 7th centuries BC. It would have had a gatehouse, and the large post pits belonging to this structure were identified. This phase was succeeded, on almost the same alignment and after a period of abandonment, by a dump rampart with a large V-shaped ditch. A parapet wall was also present. Breaches in the ramparts on the northeast and southeast sides appear to be Roman in date. 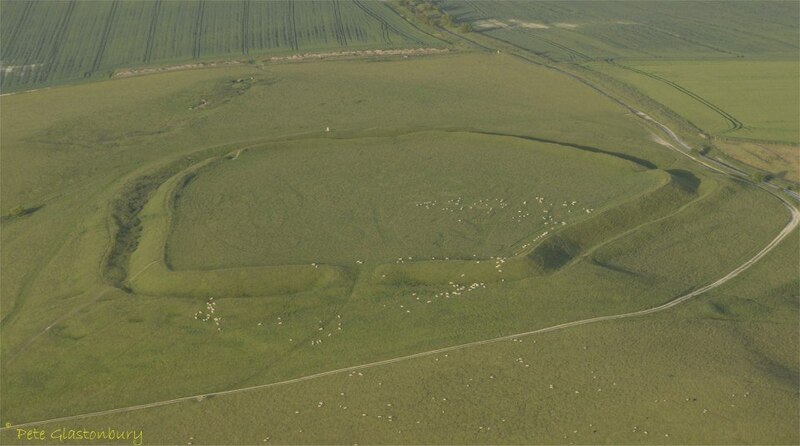 More on Uffington castle, here and here . Thank you to Pete Glastonbury for sharing these photographs and Historic England Pastscape for information on these sites.